Cobden, a rural town, is situated in a dairying district 13 km south of Camperdown and 55 km east of Warrnambool, western Victoria. It is not situated on a main highway and owes its situation to a town being formed near the homestead of a pioneering pastoral run. In 1840 Dr Daniel Curdie (1819-84) took up his Tandarook pastoral run, about 15 km south of Camperdown, on a stream later named Curdies River. His Tandarook homestead was begun in 1853. The river had an assured supply of water and further settlers came there during the 1860s. The locality was named Lovely Banks, and when a town was surveyed in 1861, it was renamed Cobden because there was already a place named Lovely Banks in west Geelong. A school was also opened in 1865. The township was named after Richard Cobden (1804-65), English Parliamentarian and advocate of free trade and the repeal of the repressive corn laws. By 1880 Cobden had the usual accoutrements of a small rural town, a school (1867), butchers, a baker, a hotel and a few stores and the rather unusual features of a temperance hall and two temperance hotels. Of the three churches, two were Bible Christian and Anglican. In 1892 a railway line from the Camperdown area to Cobden and Timboon was opened, and in 1895 the Heytesbury shire was created by severance from Hampden shire. Its administrative centre was Cobden. The railway line provided readier marketing for dairy farms and Cobden’s population doubled during the 1890s. The Cobden Cooperative Pioneer Cheese and Butter Factory had opened in 1888. Whilst most of the land along Curdies River was used for farming there was a large forested area to the east, generally known as the Heytesbury Forest. Its suitability for farming was uncertain, but patches were thought to be good. During 1928-33 the first of the farm development schemes was undertaken. It brought extra population into the region, mainly affecting Timboon. Cobden’s population remained relatively steady. Reticulated electricity was turned on in 1924 and a swimming pool opened in 1930. A private hospital operated in Cobden during 1923-50, converting to a bush nursing centre and a larger facility in 1950 and 1958. (The early days of Cobden’s medical practice are recounted in Dr David Browne’s The wind and the book: memories of a country doctor). After World War II the Heytesbury Settlement Scheme converted over 43,000 ha of the forest to dairy farms. The centre of Western District dairying was decisively shifted from Colac-Camperdown-Terang towards the Cobden district. Some of the dairy factories at the three older towns were merged, which were in turn merged with the Cobden factory where functions have been centralised. There are also a large Kraft factory at Simpson in the middle of the large Heytesbury Settlement and a factory at Timboon. Dairying is a mainstay. The Bonlac factory was enlarged in 1993, sold to National Foods then years later, but closed in 2010. A Fonterra plant has taken up some of the slack. The growth of population gave rise to the need for secondary schooling. Timboon gained a consolidated school (1948) and a high school (1960), and in 1969 a technical school was opened in Cobden. The schools have kept these roles, unlike medical facilities which have seen Timboon retain its hospital and Cobden’s changed to a medical centre. A town sewerage scheme was completed in 1976 and the last train from Cobden to Timboon ran in 1977. (Cobden residents have the choice of hospitals at Timboon or Camperdown). 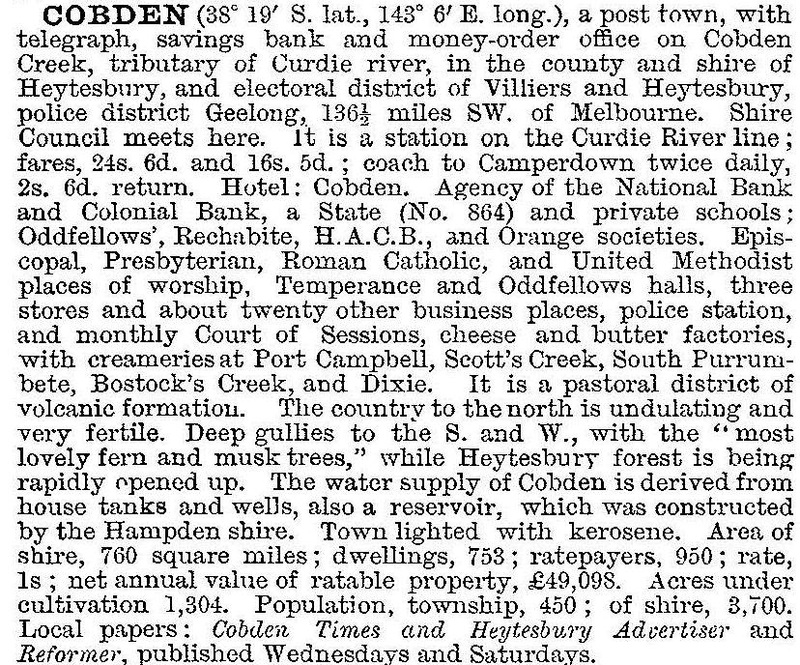 Cobden has a shopping centre, two hotels, a motel, facilities for bowling, golf and swimming, three public reserves, a technical school and a primary school (323 pupils and 186 pupils, 2014), Anglican, Catholic, Reformed and Uniting churches, a medical centre with a nursing home and the dairy factory. Dr Curdies’ Tandarook homestead, 5 km east of the town, is on the Register of the National Estate. A botanical garden is named Tandarook Park. The Cobden Times (1890) is published weekly.